This is the fourth post in this series as I continue to pass along what I learned from two old timers who mentored me when I was a mining "newbie." Read closely and you may learn a thing or two. Although my old-timer mentors could be a superstitious duo at times, they didn't place much faith in luck when it came to mining (or life in general). Their motto was "Persistence and hard work'll beat luck every time." Now you may not agree with this statement fully, but if you're as smart as most of my readers are, you see the value of the guiding principle it supports. There's no doubt that luck is a good thing to have on your side, but where does that fine line begin between just getting lucky and making your own luck? My mining mentors looked at it this way. If you just sit back and wait for luck to show up at your door you may be waiting a very long time. They always felt a guy or gal could make their own luck to a point, and the best way to make that happen was through focusing your efforts and consistently working hard over time. "You'll get a nice little pile of gold that way," is what I was told. Sure, people do get lucky. 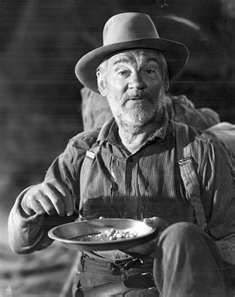 Eventually some fortunate soul will hit a $50,000,000 lottery jackpot and some lucky miner will stumble across a multi-ounce pocket. But it's what happens in between getting struck by lightning that really counts. In gold mining, it's the turtle who'll end up with the most gold in the end...NOT the rabbit. Some years back a Mexican gold prospector had just enough pesos to buy himself a super cheap-o metal metal detector that didn't have all the fancy discriminating functions or bells or whistles that we here north of the border consider absolutely necessary and are willing to pay big bucks for. Nope, this miner's detector could only do one thing...detect metal (and that not very well). This hardy soul spent many hours researching an old mining area and then set out to see if he could recover a bit of gold with his newly bought detector. You can only imagine the thousands of bits of metallic trash he spent countless hours digging up. But he kept at it, swinging that piece o' crap detector hour after hour in the hot sun, the wind, and probably the cold as well. Our Mexican nugget-shooting friend kept at it though and lest you think electronic prospecting is easy work...think again. Nothing in gold mining is easy and it all requires hard work, regardless of the approach. What's that? Oh, what about our friend, the Mexican miner? Well one fine day he swung that cheap metal detector over a clump of metal that screamed out "old car body" but got down on his knees and started digging anyway. 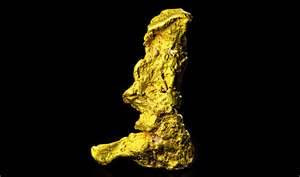 What he found buried down in that hard-packed dirt was the "Boot of Cortez" gold nugget, a 389.4 troy ounce beauty that brought a cool million dollars. Okay. Was our Mexican friend just lucky or did he make his own luck? Sure, a bit of luck helps as my old-timer mentors said. In the end, however, it'll be persistence and plain old hard work that'll make you a success in mining (and in life). If you liked this post, you may want to read: "Aussie Detectorist Unearths Half-Million Dollar Nugget"